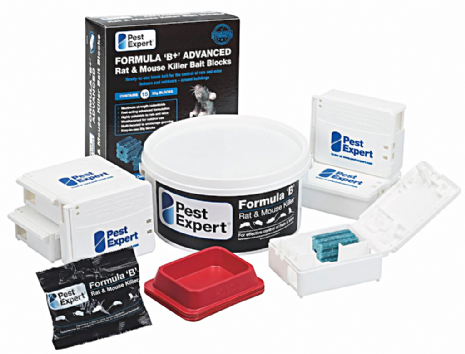 Mouse Poison Kit 1 contains both Pest Expert Formula ‘B’ Mouse Killer grain bait and Mouse Bait Blocks as well as Mouse Bait Boxes and Bait Trays and is designed for the control of a small mouse problem. All our Mouse Poison Kits contain top quality, professional-grade rodenticides from market leaders Pest Expert to help you achieve successful mouse control. 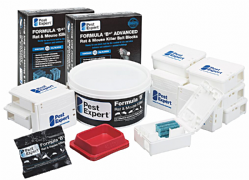 Our Mouse Kits offer two types of mouse bait – Pest Expert Formula 'B' Mouse Killer grain bait and Mouse Bait Blocks – this allows you to carry out what professional pest control technicians describe as a ‘double-pronged’ attack, which is the quickest and most effective way of eradicating a mouse infestation. Both types of poison contain the maximum strength (0.0029%) of the powerful rodenticide, Brodifacoum, and are formulated to be highly palatable to mice, ensuring high uptake and so delivering rapid results. 300g (3 x 100g) Pest Expert Formula 'B' Mouse Killer: A highly-effective professional-strength poison made from top quality whole-wheat grain, Formula 'B' is highly palatable to mice, ensuring excellent uptake and rapid results. 15 x 20g Mouse Bait Blocks (300g): Premium-grade bait blocks specially formulated for outstanding results. 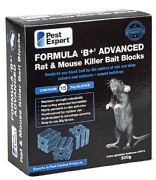 Made from a wax-free blend of ingredients to increase palatability, and designed to provide mice with multiple gnawing surfaces to increase bait uptake, these bait blocks will achieve rapid control of a mouse infestation in your home or business. For use with the Mouse Bait Boxes provided for secure baiting in sensitive areas. 6 x Mouse Bait Boxes: The bait boxes are lockable and tamper-resistant so are perfect for use with Mouse Poison Bait Blocks for safe mouse control in homes with children and/or pets. Professional Rodent Advice Sheet: Instructions on how to achieve successful mouse control. Open each Mouse Bait Box, place 1 bait blocks or one 100g sachet grain bait into the internal compartment, close/lock the boxes and place at 2-5m intervals along the edges of a room. Check bait boxes every 2-3 days and replace mouse poison and bait blocks as necessary until no more bait is taken. If you have a moderate or severe mouse infestation then please see our Mouse Poison Kit 2. Formula B grain bait is now supplied in easy-to-use 100g measured sachets, enabling precise baiting for improved control. Amazing!! Worked effectively and efficiently - Great value for money too. Fab! Just what I needed. Was easy-to-use and quickly worked! Fantastic package! Quickly killed the mice - highly recommended! The mouse kit arrived promptly and had a good selection of products! The poison worked quickly and we no longer have a mouse problem!! Fast delivery as described Easy ordering service, clean efficient email updates on processing and dispatch. I would use again. Great product and great advice sheet I had tried a well known brand of rodent poison before, but it was so freeze dried that it didn't smell like wheat and consequently the mice would not eat it. The pest Expert kit was great value and both the formula B grain and wax free bait blocks were soon consumed by the mice. After about 4 days of gorging themselves all activity stopped, although I have followed the advice given and am leaving bait down for a while yet. excellent, my problem was cured in 4 days. The product arrived the day after ordering, it was excellent. And my problem. Was solved in 4 days. Seven down ? to go. Caught 7 mice in traps. Since putting bait boxes and grain down no further sightings to date. Prompt delivery and easy to follow instructions.